In some ways I am very old fashion. I like to write in pencil, graphite as they were called when I was a child. Lace has been another beautiful surprise in my life. I find myself attracted to the intrinsic details of YO (Yarn Overs) and SSK, K2 Tog and all the rest of that Jazz. I think the most exciting part of this project is the fact that I am making it from a CHART!!!! 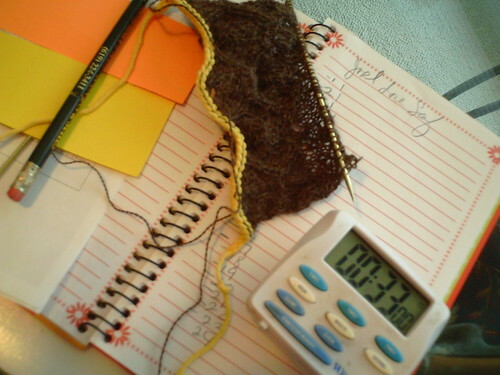 Lace Charts are very interesting, you start at the right to the left, then left to right, you really have to pay attention, otherwise you will purl when you are suppose to knit. I am enjoying this project and what you see is a timer, Well is on 33 minutes you will think I am expecting a Cylon Attack, well maybe I am. I time my projects, so that I can give all my WIP a time every day, well almost every day. Thanks for stopping by, I need to Jump and restart the timer. JUMP!